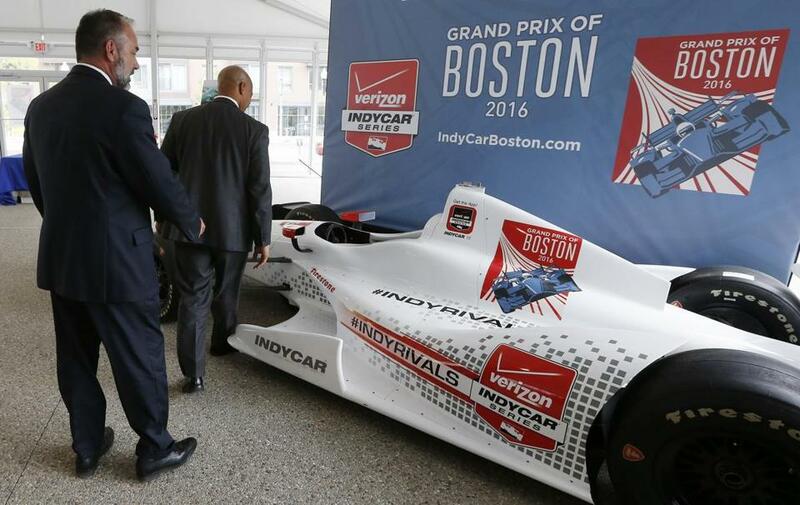 City officials examined an IndyCar mock-up after a news conference in 2015 announcing the inaugural Grand Prix of Boston. Where do you put 2,000 concrete barriers that you won’t need until August? That’s the problem facing organizers of the IndyCar race coming to Boston after they were told they could no longer use a site at the industrial park along the Boston waterfront because the land is reserved for maritime uses. The barriers started arriving weeks before tickets went on sale to the general public on Tuesday. Now it’s unclear where race organizers will relocate them. They struck a month-to-month deal with the Massachusetts Port Authority to store them at the industrial park site. Organizers initially said they hoped to store the barriers there until construction on the 2.25-mile race loop nearby in South Boston begins in mid-August for the Labor Day weekend event. David Lurie, a lawyer who represents opponents to the IndyCar race, had complained to the state Department of Environmental Protection on March 7 that the storage of barriers violates Massport’s permit under Chapter 91, the state rule that governs tidelands and many other significant waterfront areas. Massport’s license for the marine terminal site where the barriers are stored requires the agency to reserve the property for maritime industrial uses. Justine Griffin, a spokeswoman for Grand Prix of Boston, said race organizers are assessing available sites that are closer to the track and can serve as longer-term locations for storage. The organizers, she said, knew the Massport site would be temporary because of the agency’s long-term development plans. Organizers are already collecting large concrete barriers for the event, which are being stored at a site near the course. Massport is seeking bidders to develop the waterfront site where the barriers are now stored. The 30-acre parcel is owned by the city, but Massport controls it through a long-term lease. About 23 of those acres are hitting the market; Massport already has a seafood-related development planned for the remainder. Massport officials said the agency signed an agreement with Grand Prix of Boston, effective Jan. 27, to allow race organizers to store the barriers on a portion of the marine terminal, in return for $14,500 a month. Thomas Glynn, the agency’s chief executive, said Massport made it clear to race organizers that the marine terminal site could not be a long-term solution. Glynn said about 200 of the roughly 2,000 barriers needed for the race have already arrived.